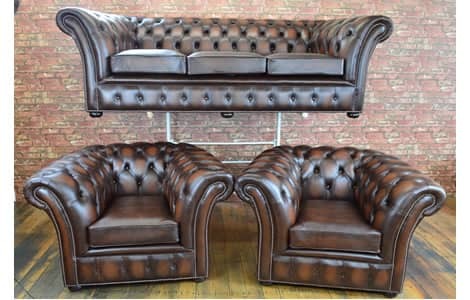 Here we have on sale The Belmont Chesterfield Range 3 Seat Sofa and two Club Chairs. Finished in Traditional Antique Brown leather. Ready for dispatch at the earliest opportunity. The Belmont Chesterfield is designed around the classic Chesterfield, with flared arms and a contemporary look, it is an assett to any home.